News headlines on this report say that the PPI in the EMU accelerated in February. Do not believe it. I have long had my quibbles with how journalists describe economic reports. Today’s PPI report is an example. The headline PPI increased by 0.1% in February after a 0.4% rise in January. Manufacturing prices gained 0.2% after a 0.1% increase. How is a drop in the month-to-month price gain an acceleration? How is the smallest measurable monthly increase from 0.1% to 0.2% month-to-month a real acceleration? Or maybe journalists have in mind the year-over-year rate that ‘gained pace’ to 3% from January’s 2.9%? Again that’s acceleration by the smallest possible amount. But apart from January, February’s PPI has a growth rate that is the same or lower than all year-over-year PPI growth rates since May 2018. Should that be called acceleration? Manufacturing prices gain 1.4% year-over-year, above the 0.9% posted in January. But here too manufacturing prices were at this pace or higher in all month before January back to March 2018. Clearly, inflation has been subdued and has not been accelerating. This point of view endorses looking at economic data and trends as the statistical measures they are. They are not pure numbers. They are measures with imperfections. We, as analysts and mortals, impose our own framework on them to understanding them by looking at changes month-to-month or over 12 months. These are our own arbitrary decisions. Of course, central banks do not help us to sort out this mess when it comes to inflation. In fact, they make it worse. In the U.S., the Federal Reserve has a 2% target for inflation using the PCE deflator, but it will also step back from it to look at the core PCE when oil prices gyrate. And then the central bank only seems to talk of year-over-year price changes. Clearly, it is interested in market expectations for inflation ahead; yet, the change in prices from 12-months ago is not forward-looking at all. And when the Fed vets its past effort by looking back at prices, it takes no further action to remedy past mistakes. Fed inflation policy is singularly and unabashedly forward-looking. The fact is that the Fed has a policy that is geared to expectations which it talks about a lot. Yet, it seems to vet its success by looking back at year-over-year price trends. That should be confusing to you. If it is not, you are not paying attention. The ECB’s pledge is for inflation to be close to but a bit below 2%. In practice, the ECB has an issue since its hard money members are glad to have inflation anywhere below 2% even zero, while most EMU members would prefer the inflation pace snuggled up close to the 2% mark. So economists too have a hard time with numbers and what they really mean. 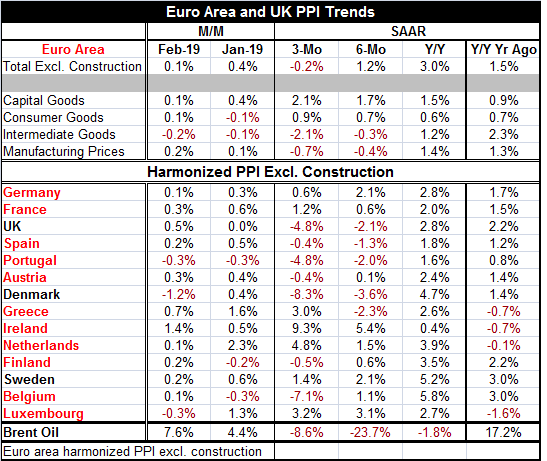 The February PPI which is not the inflation targeted by the ECB shows the headline pace at 3% with manufacturing inflation at 1.4% and the various manufacturing sub-sectors at year-on-year rates ranging from 1.5% to 0.6% (see Table). On the month, inflation is showing more gains than declines: only three countries saw price declines month-to-month; three showed increases of 0.1%; three others showed increases of 0.2%; two had increases of 0.3%; and three others had larger increases for month-to-month prices. On the whole, that seems to be pretty well-behaved price action. From 12-months to six-months to three-months the annualized headline, manufacturing prices and intermediate goods inflation rates all sequentially decline. But capital goods and consumer goods inflation on those progressions both are showing steady if minor accelerations. Inflation is always a puzzle. Inflation is a macroeconomic phenomenon and when we look at detail we are looking at some inflation force, yes, but also shifting in relative prices and at statistical noises, one time effects and bad seasonal adjustment – just to name a few issues, and these are not exactly inflation. It is hard to filter out the noise and find the true trend. Policy-makers that vote on interest rate decisions have to make the same tough choices we do. There is no cheat sheet for truth. On the whole, since oil prices are still declining, headline inflation will tend to be controlled. But in each of the past two months, oil prices have been rising. And while Brent oil is down at an 8.6% annual rate pace over three months, it is up by 7.6% in February after a 4.4% rise in January. On global markets as of today, Brent prices are at their 2019 high. So oil is not out of the picture and geopolitical events continue to kick oil prices around a good deal making oil prices about more than just supply demand and OPECs grip. Of the 14 countries in the table (3 of them are not EMU members), inflation is declining over three months compared to six months in eight of them. It is decelerating over six months compared to 12 months in twelve of them. It also is decelerating in three-months compared to 12-months in ten of them. The forces of deceleration are strong. But the fact that oil is rising should cause us to be more circumspect about our prospects. Inflation is not dead. It is just in a down cycle that is about to shift. And even that shift, it does not means that there will be meaningful acceleration. There may be ordered acceleration for a while, but where it goes and how long it lasts and whether or not it becomes virulent will depend somewhat on oil and somewhat on global growth conditions. It will also depend on the sustainability of any oil price rise itself. And in this expansion, oil prices have been unstable. So far in this cycle, getting lasting inflation in gear has been harder than trying to start a campfire on a rainy day without a match. That could change. But there is no reason to think that it is about to especially with global growth still weak and perhaps still weakening.